Visitors to South Sligo can book their children into the following camps at Masshill Campsite for the month of July. 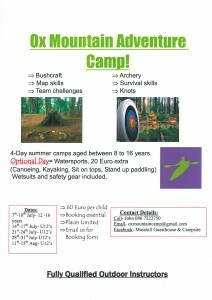 Adventure Camps in Bushcraft, Map Skills, Archery, Survival Skills and much more. Optional day of Water sports on Lough Talt with Wild Wet Adventure – Canoeing, Kayaking and Stand Up Paddle Boarding.